Universal badge/ID models for pant-pocket wear! Non-recessed Badge & ID Case These duty leather book style single ID cases are designed to hold your badge inside the case, but is not custom cut "not recessed" to fit your badge. These cases are made from Top Grain Leather with rounded and stitched corners for maximum durability. Unique feature of these cases is the SNAP closure. 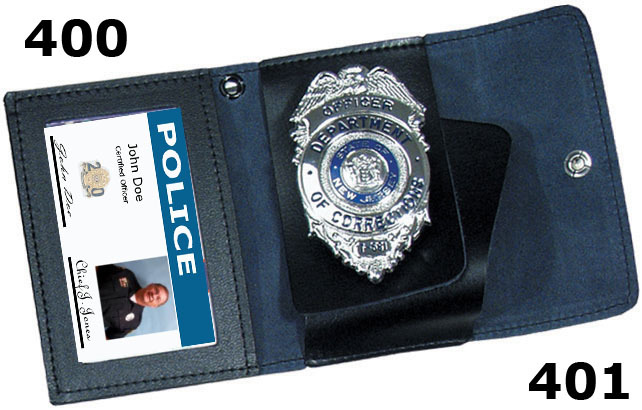 Non-recessed Badge & ID Case These duty leather book style single ID cases are designed to hold your badge inside the case, but is not custom cut "not recessed" to fit your badge. These cases are made from Top Grain Leather with rounded and stitched corners for maximum durability. Unique feature of these cases is the VELCRO closure. Non-recessed Double ID Badge Case This duty leather book style double ID case is designed to hold your badge inside the case, but is not custom cut "not recessed" to fit your badge. These cases are made from Top Grain Leather with rounded and stitched corners for maximum durability. Unique feature of this case is the VELCRO closure. Non-recessed Double ID Badge Case This duty leather book style double ID case is designed to hold your badge inside the case, but is not custom cut "not recessed" to fit your badge. These cases are made from Top Grain Leather with rounded and stitched corners for maximum durability. Unique feature of this case is the SNAP closure. We cannot show every single badge in every single badge case. The models are shown with a sample badge and cut. 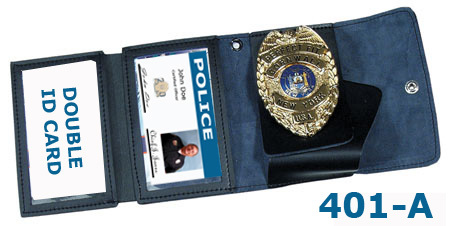 When we make your badge/ID wallet, we cut it custom for the badge you have chosen.